Crate Climbing is placing one crate on top of another with the scout remaining standing on the top most crate without falling at anytime. The aim is to see how high they can get before the pile of crates topples over or the climber falls off. The scout will start by standing on top of one crate, which is placed on the ground. They will then attempt to place another crate on top of the first and maneuver themselves to stand on top of the second crate at the same time. 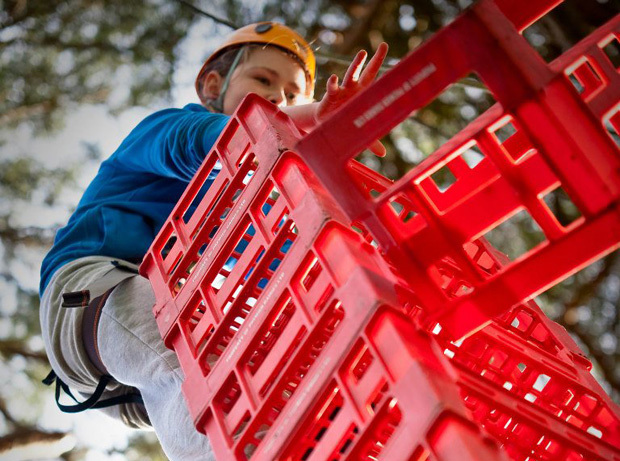 Scouts will have their balancing skills tested as well as having to try to work out the best method to achieve the climb, depending on how successful you are you may reach the top. A head for heights can also be an advantage. This activity encourages self confidence & team building. Balance, confidence and pushing yourself to the limit are all key to this activity! But don’t worry you are attached to a rope and won’t fall anywhere! A great team builder that everyone can join in with, even if you don’t want to climb. Participants to tuck all loose clothing in and remove neckerchief. Jewellery should also be removed. Participants to wear appropriate footwear, no sandals or flip flops. Runners are perfect for this activity, while boots is ok, they do restrict getting a good foothold in the crates. Participants to listen to instructor at all times, stay within safety zones at all times, and to wear helmets and not to adjust equipment after being checked by instructors. Please click on the date you want to book into Larch Hill to begin booking enquiry.